Chris Hall and team team at Saxon Sports Frankston are long time Supporters of the Mt Eliza Cricket Club and is the Preferred Supplier for its Equipment. Saxon also provide the clubs preseason training with its fantastic indoor nets and Bola bowling machines. Many of Mt Eliza's Junior & Senior players get one on one coaching with the fantastic range of cricket coaches that suit any needs from batting, pace bowling, spin bowling, fielding and much more. The new season stock has arrived in the cricket shop. So if you want a close up look at the latest in cricket equipment visit the shop and dont forget to mention your from Mt Eliza Cricket Club. Inddor Cricket and Soccer runs All year round and players from the Mt Eliza Cricket Club participate in both these so why not register your team today by calling 97836066. You can also enjoy a couple of drinks with the fully licenced bar. 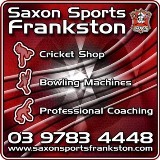 Saxon Sports Frankston Also does Childrens sport parties.